Lysine is an amino acid which cannot be made by the body and can only be obtained from food or supplements. 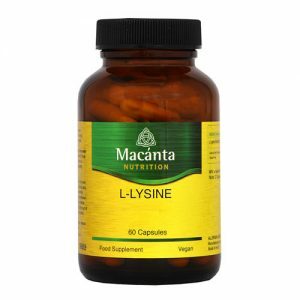 Macánta L-Lysine gives you 1000mg of this essential amino acid which is a necessary building block for all protein. L-Lysine is a key element in the growth, maintenance and health of skin tissue, and is also used by the body to produce collagen which is important for bone and connective tissues such as skin, tendons and ligaments. Lysine is also needed to produce carnitine, a nutrient responsible for helping the body turn fatty acids into energy. Lysine has traditionally been used for many years to help speed up the recovery from and prevent future recurrence of cold sores. Take 1-2 capsules* per day, with or before food. *Two capsules contain 1000mg of lysine. As a food Supplement for adults, take one or two capsules* per day with or before food. *2 capsules contain 1000mg of lysine. Do not exceed daily dose unless otherwise directed by a healthcare practitioner. Food Supplements should not be used as a substitute for a varied diet and healthy lifestyle. Not intended for use if you are pregnant or lactating. If you are taking any medication or have a medical condition please consult your healthcare practitioner before use. Keep out of reach of children. Do not use if lid seal is missing. Store out of direct sunlight, in a dry ambient location.